1. Read the statements in SECTION #1. 2. 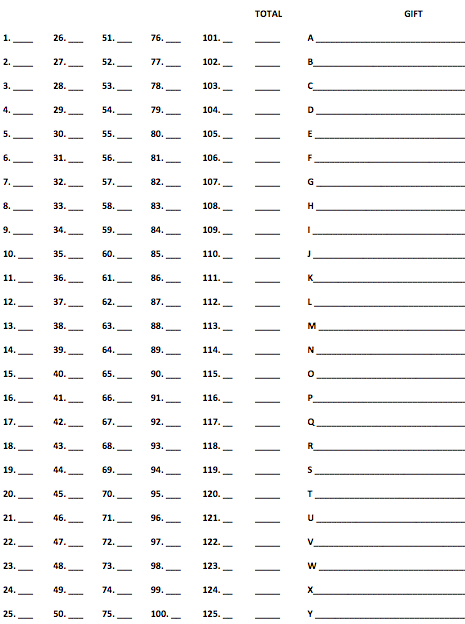 Download and print the answer sheet in SECTION #2. 3. Record your answers on your printed answer sheet. ​4. Circle the 6 highest totals in the 'Total' column. 5. Record your top six spiritual gifts in the right column, by using the legend in SECTION #3. 6. Complete and submit the online form in SECTION #4. I enjoy working behind the scenes taking care of little details. I clearly sense it when someone is under a spiritual anointing. I’m very confident of God doing great things through myself or the church I attend. I’m asked to sing or play a musical instrument at different church functions. When people pray in tongues I often believe that I understand the meaning. I have an ability to use my hands in a creative way to design or build things. People have told me that my prayers resulted in their healing. I would enjoy ministering to people in hospitals, prison, and rest homes to comfort them. While talking to other people I became aware of needs in their life that have not been discussed. I enjoy spending time with non-Christians, especially with hopes of telling them about Jesus. I would like to assist the Pastors or other leaders so they will have more time to accomplish their essential and priority ministries. I’m often chosen as the leader in a group of people. I enjoy entertaining guests and making them feel “at home” when they visit. I’m a very organized person who sets goals and makes plans to reach them. Others have said that I am a person of faith and vision. I feel compassion for people who are hurting and lonely, and like to spend time with them to cheer them up. Those for whom I minister claim that my insights into their problems have surprised them. When a question arises from a difficult Biblical passage, I am motivated to research the answer. I have been used to establish and raise up a strong local church. I can adapt easily to cultures, languages, and life-styles other than my own and would enjoy ministry in foreign countries. By the revelation of the Holy Spirit I have revealed specific things which will happen in the future. I find it easy to invite a person to accept Jesus as their Savior. I pray at least one-half hour daily for other people believing God to answer my prayers. I enjoy relieving others of routine tasks so they can get special projects done. I don’t mind asking others to accomplish an important ministry for the church. I am able to distinguish between right and wrong in complex spiritual matters that other people can’t seem to figure out. I often step out and start projects that other people won’t attempt and the projects end up successful. Church leaders have told me that they believe my public interpretation of a message in tongues was accurate. My prayers have resulted in physical healing in the lives of others. I would like to use my natural skills to bless the Lord’s work. God has blessed me with the ability to make more money than I need, so I cheerfully give much to the church. People often seek my advice when they don’t know what to do. When praying about someone’s circumstances, I receive insight into their condition that I have not previously considered. I feel a need to challenge others to better themselves, especially in their spiritual growth, without condemning them. My prayer time is the most important part of my day. I would like to do things like typing, filing, gardening, painting, etc. for the church, or helping in any way that I can. I can guide and manage a group of people toward achieving a specific goal. I would like to use my home to get acquainted with newcomers and visitors to the church. I would rather be active and accomplishing something than talk, read, or listen to a speaker. I am able to recognize gifts and abilities in others and help them find ministry where they are effective. I can tell with a fairly high degree of assurance when a person is affected by an evil spirit. I trust in God’s faithfulness for a bright future, even when everything looks bad. God has blessed my prayers so that supernatural results have come to otherwise impossible situations. I find satisfaction in meeting people’s needs by making something for them. I enjoy praying for those who are physically and emotionally ill in order that God can heal them. I have been willing to maintain a lower standard of living in order to give more to God’s work. When I hear of other people without jobs who can’t pay their bills, I feel motivated to help them. During church services, I can sense the immediate spiritual need of the congregation. I enjoy working with people and desire to help them be the best people they can for the Lord. Pastors or churches in other parts of the country look to me for spiritual oversight. I feel a special, spiritual burden for another area or country of the world. My strongest desire is to see the lost come to know Jesus Christ as their savior. I enjoy helping others get their work done and don’t need a lot of public recognition. I’m comfortable making important decisions, even under pressure. When I pray in tongues I sense that I am being spiritually strengthened. Through my faith and prayers God has opened doors that were impossible in the natural. People say I am gifted with my hands. I believe God will bless me financially so that I can give generously to His work. I would enjoy working with the “unfortunate” and the “have-nots” who are usually ignored by most people. In counseling situations, I sometimes have an instant awareness of facts not previously discussed. Teaching others about what I’ve learned in the Bible is very fulfilling to me. I have helped Christians who have backslidden to be restored back to the Lord. I would be excited to share the Gospel and form new groups of Christians in areas where there aren’t many churches. During church services, I frequently sense the needs in the congregation. I get frustrated when others don’t seem to share their faith with unbelievers as much as I do. H. Music - The God-given ability to sing or play an instrument in a way that the church is strengthened and God is glorified. I. Tongues - The God-given ability to communicate in a language, either divine or human, that you are not familiar with. J. Interpretation - The God-given ability to interpret an utterance given in tongues into the common language of those present. P. Word of Wisdom - The God-given ability to receive divine insight in how to respond to complex and difficult problems and situations. Q. Word of Knowledge - The God-given ability to receive a spontaneous knowledge of facts or details about a person or situation that has not been discovered through natural inquiry. T. Pastor - The God-given ability and motivation to commit yourself to the care and nurturing of members of the Body of Christ. V. Missionary - The God-given ability and calling to use your spiritual gifts to minister to those of another culture on a long-term basis. List the six gift areas of which you received the highest score.